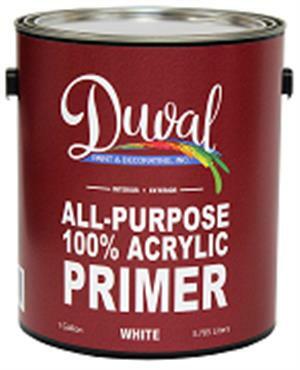 100% Acrylic Primer/Sealer Stain Killer is a specially formulated 100% acrylic, universal primer/sealer that offers excellent product versatility for application to a variety of both interior and exterior surfaces. It meets the performance standards for both professional and residential applications, and its special stain blocking formulation provides excellent block-out of surface stains and surface markings, such as water stains, pencil marks, inks, crayon marks, smoke stains, lipstick, wallpaper, etc. which can bleed through most applied finish paint coatings. Easy to apply, it provides superior coverage, is fast drying, bonds to glossy surfaces, offers excellent sanding properties, and is mildew resistant and meets MPI Standard #39 of the Master Painters Institute's approved products list.